Random House Children’s Books, 2015. Echo is a young runaway and accomplished pickpocket who was discovered late one night deep in the public library and introduced to a world other humans know nothing about. After her discovery Echo is taken in by an Avicen leader and raised with the young Avicen in a secret society that can magically travel the world. Soon Echo is embroiled in a quest to end the war between the Avicen and their deadly rivals. Can Echo save the world for the warring races and for humanity as well? What will be the cost? I think I picked this book by title and cover alone – both are awesome! So when I began to read I was rather dismayed that this was a book about bird-people. I like books about magic; I’m generally good with fantasy; but bird people, ugh. I guess it’s the feathers. At any rate, my dismay didn’t last long. Echo is a tough and loveable character. She’s cocky enough to love and damaged enough to provoke sympathy. I was rooting for her the whole way. (And her adopted bird-mama is pretty awesome, too). Echo’s adventures and moral dilemmas drew me in, and Grey raised enough interesting emotional questions to have hooked me for the long haul, even if some of the characters have feathers and others have scales. This is an engrossing young adult fantasy with enough adventure and romance to keep you reading. There’s a certain darkness to the world that reminded me of Gabriel Finlay and the Raven’s Riddle, which is for middle grade readers but also from Random House. It’s got bird people, too. 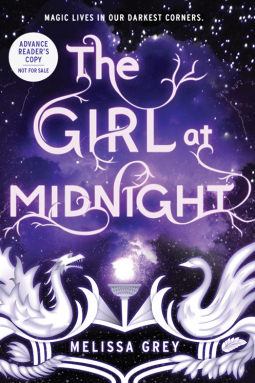 I read The Girl at Midnight courtesy of NetGalley and Random House Children’s Books. It looks to be the start of a series. I’ll start looking for the next installment next spring.